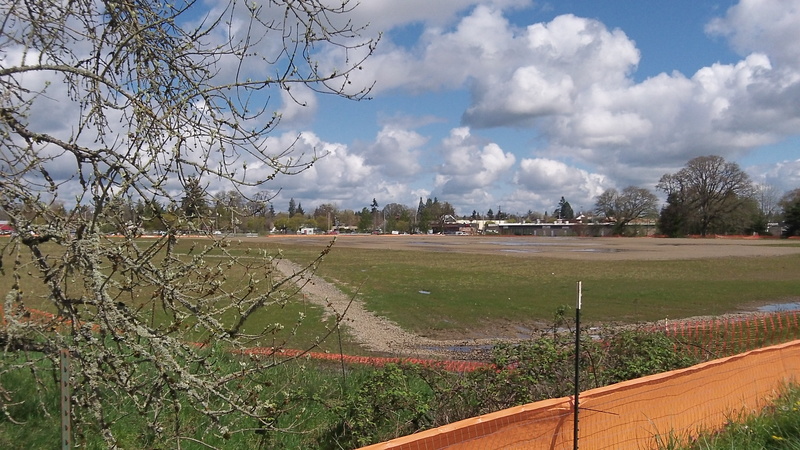 The vast empty lot basks in the spring sunshine on Friday. On Facebook and elsewhere, the questions keep popping up: Is the Lowe’s company going ahead with its long-pending plans to build a home improvement center at Ninth Avenue and Oak Street in Albany? And if so, when? The answers may be only days away. The agreement called for a store opening date because the city had to invest a large amount of money in street improvements to handle traffic anticipated with a big store at the southeast corner of Ninth and Oak. News stories at the time put the city’s costs of the $5 million-plus project at about $4.4 million. The costs covered reconstruction of Oak Street all the way from Ninth to Queen Avenue. Also included: Buying the right of way and extending Oak Street one block north to Pacific Boulevard. The street work was completed last year, and Lowe’s site of about 12 acres was cleared and graded for construction. How about Lowes goes away, and restores all the Historic Oak trees from Hackleman’s grove instead. The bottle redemption center, in vacant bldg at Santiam/Main, was rejected because of fears of increased traffic. Has the City any idea of the amount of traffic Lowe’s will add to 9th Avenue? My view is that it will be a regret to our great-great-great grandchildren that this area wasn’t kept as a natural park. From 9th to Queen Ave. What a legacy “we” could have left to future generations. Those in New York sure put a high price on their Central Park. Maybe they could use some of the $2,000,000 to repair Queen Ave East of Oak and 14th between Oak and Hill for the damage caused by the heavy equipment & 100’s of trucks hauling dirt & rock during the construction of Oak. Queen is a “washboard” in the bike lane from the tracks of heavy equipment and 14th has numerous cracks near Hill that didn’t exist before.